Three comic book shows coming up! 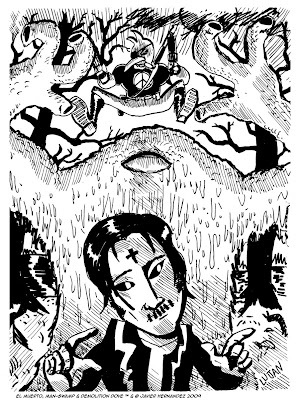 I've sent my new comic book, MANGA MUERTO VOL 1, off to the printers, and I've just finished the artwork for the back cover of my friend Colin Panetta's comic, DEAD MAN HOLIDAY. I will, of course, update everyone here on the availability of those two books (and I'm going to check with Colin on when we can show the artwork online). It's my first full-color, back cover artwork, and I couldn't be happier doing it for a book I really enjoy reading! Now I have to get ready for 3 comic book conventions over the next month and a half. 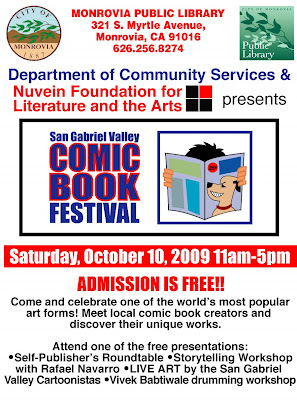 First up is the 2nd SAN GABRIEL VALLEY COMIC BOOK FESTIVAL, being held on October 10 from 11am-5pm. The festival will be held at the Monrovia Library, running concurrently with the Monrovia Arts Festival the same day. Presented by the Nuvein Foundation, a local non-profit arts and literature advocate. C'mon down and visit local comic creators, and let's continue to grow our own hometown comic book festival! I'll also be exhibiting at APE in San Francisco on October 17 & 18 (my 11th consecutive appearance!). 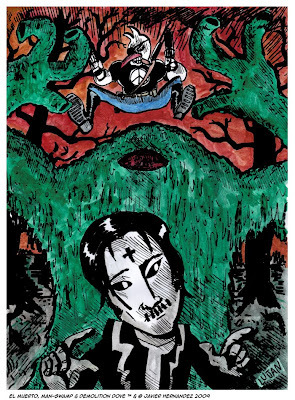 Swing by and pick up both MAN-SWAMP and MANGA MUERTO VOL. 1, my two newest comics hot off the press! Plus new buttons, and more surprises! And on November 15, I'll be making my first appearance at the Portland Comic Book Show. I'll actually be a guest of the show, and I'll even be conducting my seminar, "DIY Comics: The Secrets of Self-Publishing" at the show! Thanks to Richard from the PCBS for extending the invitation, and to my good friend Jason Martin for letting Richard know about me. I'm really digging the Portland comics scene, having been there previously for the Stumptown Comic Festival (which I blogged about here). 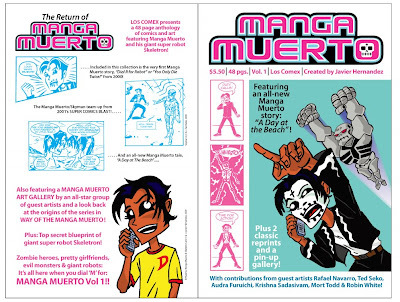 Here's the back cover/front cover spread for MANGA MUERTO VOL 1, cause every blog post should come with at least one pretty picture! 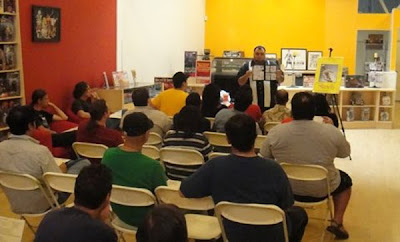 San Gabriel Valley Comic Book Festival, October 10! 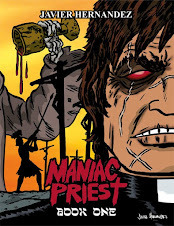 Rafael Navarro (SONAMBULO), Michael Aushenker (CARTOON FLOPHOUSE), Mat Nastos (NIFTY COMICS), John Narcomy (HIGH TOWER COMICS), Geo Brawn (The Untold Chronicles), Agimat Comics and more! Programming will include a Self-Publishers Roundtable panel, a storytelling workshop with Rafael Navarro and a Live Art demonstration by the Cartoonistas! The festival will be held concurrently with the Monrovia Arts Festival, which will be held in the park outside the Library. Admission to both events is free! Vince wins an EL MUERTO DVD, signed of course! Cameron will be getting some signed comic books! The judges were myself, Jim Lujan and Ted Seko. All three of us voted independently, but had tough choices all around! We all agreed that each piece demonstrated a different approach to coloring, all valid, all very appealing. Each piece had varying degrees of emotional appeal, visual inventiveness and delicate color balances. But all of them really sang to us. I want to thank my friends Ted and Jim for helping out as judges. Thanks again also to Jim for giving me that beautiful drawing in the first place, simply as a gesture of friendship. And my sincere gratitude to the participants for taking time to contribute their own unique artistic visions to these drawings! Art really is the gift that's irreplaceable, in my opinion. Coloring contest ends this Saturday! 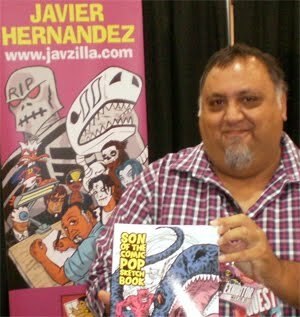 My online coloring contest, "The Hernandez Trifecta Coloring Contest of Champions" ends this Saturday! 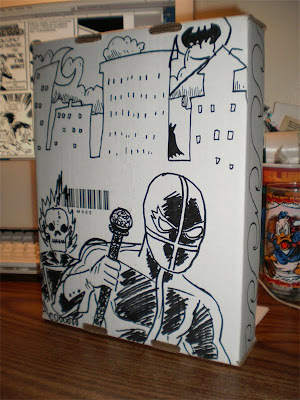 The rules are on this previous post, but here's the just-finished Jim Lujan/Javier Hernandez Prize Box w/Jam Art! What goes in this box? The Grand Prize package, of course! How do you win this? Why, ya gotta color this great piece of Jim "King of Cartoon Movies" Lujan art, featuring my comic book characters! Deadline is this Saturday, at 12 Noon, PST. Get your entry in and the winning artist will be announced on my live podcast, JAVILAND, this Sunday! Check out the rules here, and break out your digital crayons! 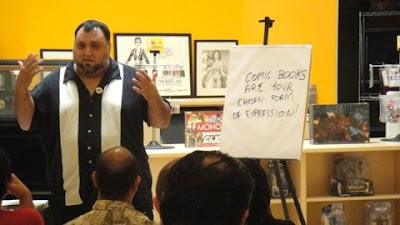 On Saturday, I conducted a seminar on self-publishing comics at GEEKS, our friendly, neighborhood, upscale comic book shop nestled in Uptown Whittier. The seminar was suggested to my by Sal, our man at GEEKS. Many of his customers had asked him for advice on self-publishing, so he thought I would be a good candidate to approach. I thought it was a great idea, as I like sharing my insights and experience with others, and I was actually curious to see what type of turnout we would have on a Labor Day weekend. At one point, we had filled all 30 seats, with several folks standing for the nearly 2-hour seminar. It was scheduled for 1 hour, and some folks has to leave at the hour mark, but most stayed, asking questions on everything from copyrights to how much time it takes to finish a book. There were a few people in attendance who are already creating their own books/web comics, but most seemed interested in learning just how to go about getting started. The one thing I tried to get across is the amount of work, time and passion you have to put into publishing your own comics. And of course to always think of expressing your own voice first, rather than primarily looking at this as a way to make tons of money. Making money is a perfectly legit goal (I know I pursue every time I print a book, but the basis of my comics are creating unique, personal expressions of art). One of my four talking points was 'DON'T CREATE IN A VACUUM'. Which is a shortened way of saying don't create 32 completed pages of a comic book, and then try to find out about printers, conventions, networking, etc. Think of your comic from every aspect before you decide to self-publish (because obviously, 'self' means you are going to it on your own, and 'publishing' means printing the books, arranging distribution, marketing, selling, etc). Learn from others how to go about getting your book in people's hands, making contacts with retail outlets, internet marketing and more. With the same passion and commitment that you use in creating your stories, writing your scripts and drawing your pages. The first reward you're going to get is that you created something on your own, and produced a physical manifestation of it with your own money. The second half of the equation is that you have to get the word out about you and your work (because branding yourself and your work as one inseparable entity is your brand!). These are all my own thoughts on self-publishing. Everyone will have different ways to approach the subject. But my experiences and successes and setbacks all come from my personal way of doing things, and by sharing those with others, it gives them examples of how things can be done. For me, sharing ways to make comics, and encouraging others to do so, doesn't create more competition for me. It just makes more people aware of the possibility to have their own voice in comics. In my 11 years of self-publishing, I've met every type of creator: some of the miserable, self-loathing variety, others full of pompous hype, the ever present wannabe-Hollywood player, and worse. But I've also seen far more creators who are having fun with their work, working hard to get better and build their audience, and innovative, creatively inspiring artists just trying 'to make an honest buck'. You can't teach or guide people to fall in any group, but you can do your best to inspire them positively by your example. That's what I hope I do for others. The photos I used to illustrate this blog were taken by a wonderfully nice couple who attended my workshop. 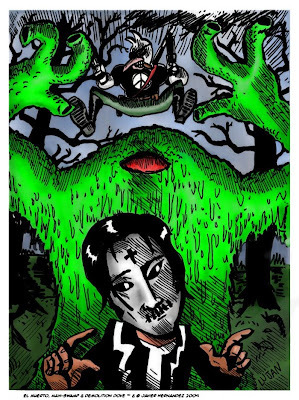 Adonna & Arvie from Agimat Comics (shown below), which features their debut web comic SHADOW CANDY. Looks like they hit the ground running in launching their web comic. I wasn't aware of their work before, but I'm really glad I got the chance to meet them. Check out their site and subscribe to their comic! And don't forget to follow em on TWITTER! thanks as well to everyone who attended. The pleasure was all mine! Now I guess I better get started on my long-gestating handbook I've been meaning to write on D.I.Y. comics publishing, right?! The "Hernandez Trifecta" Coloring Contest of Champions!! Okay, so after all these years of self-publishing and making comics, I decided it was now time to have a contest! Grab your pixels, your crayons and make me a rainbow! Yes, a contest, here on JAVZILLA, The "Hernandez Trifecta" Coloring Contest of Champions!! With real prizes! Thanks to my good friend, animator extraordinaire, Jim Lujan, for the original art and the suggestion. 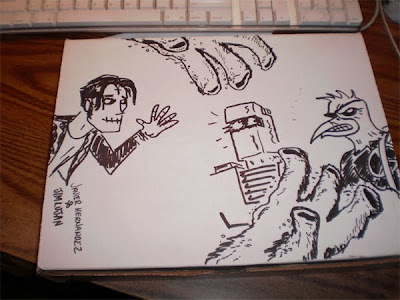 A week or so ago, Jim and I had a nice breakfast where he presented me with a drawing of my comic book characters, El MUERTO, MAN-SWAMP and DEMOLITION DOVE. I was really taken back by the gesture, and also loved it as a great piece of art. Jim said I could to whatever I wanted to with it! He even suggested a coloring contest. This morning I kept thinking about his suggestion, and here we are. 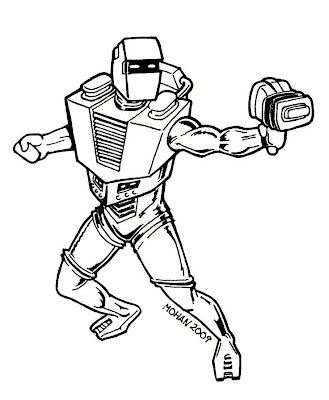 1: Image can be digitally colored, or print it out and color it by hand! Crayons, , acrylics, whatever! 2: Please don't redraw the image. I want to preserve Jim's signature line work for generations of fans to admire! 3: All artwork is due by Sat., September 12 @ 12 Noon, Pacific Standard Time. 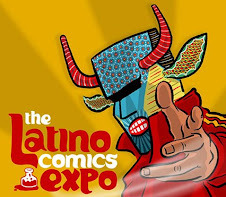 Email your entry to azteczombie (at) yahoo.com. Please include as subject header: COLORING CONTEST. Include your name and any of your personal internet sites you want to promote. Email your artwork whenever you want, just get it in before the deadline. 4: Winner will be announced live on my podcast, JAVILAND, on Sunday, September 13, between 6pm-7:30pm, PST. If, due to unforeseen circumstances the show is not recorded that day, I'll post the winning entries on this blog Sunday night. Winners need not be present, but it's a cool show to participate in! 5: Everyone who enters the contest is giving me the right to display the finished, colored piece on all of my internet sites (blog, myspace, deviantart, etc) from now until the end of time throughout the hundered billion multiverses! All artists will be credited as colorists for their entries. For the first month or so, I'll use the winning entry as my avatar on Facebook, Myspace, Twitter, etc. Your participation in the contest means you agree to these terms. 6: Winning entries will be voted on my myself, Jim Lujan and one other mystery artist. Just please don't hate any of us after the votes! 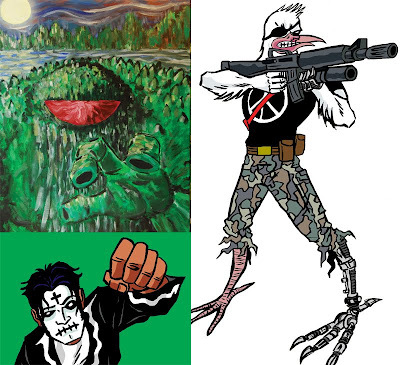 King Size El Muerto #1, MAN-SWAMP #1 (featuring DEMOLTION DOVE back-up story), THE HUMAN FLY #1 from Marvel Comics! !, 3 buttons featuring El Muerto and Demolition Dove, a Dixon Ticonderoga pencil so you can make your own comics, EL MUERTO DVD (featuring the Javier Hernandez/Mort Todd exclusive El Muerto mini-comic). Also, I'll sign my comics and DVD. Some bonus items will be added as well to the package! 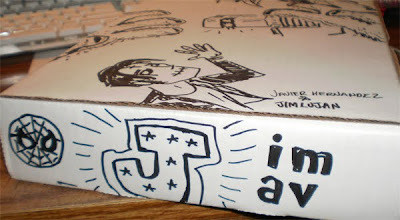 And if all this wasn't enough, Jim Lujan and I will doodle up the shipping box with a one-of-a-kind jam piece. If this ain't the Javzilla Age of Giving Away the Farm, I don't know what is!! Jim doodling up the prize box! 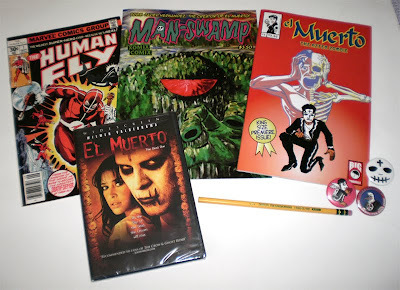 1ST RUNNER UP will get the EL MUERTO DVD. 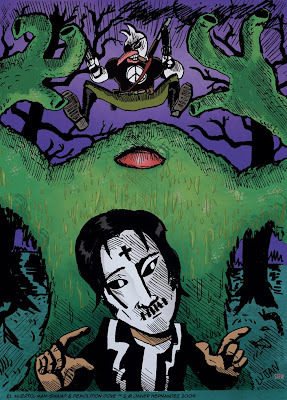 2nd RUNNER UP will get a MAN-SWAMP comic and an EL MUERTO comic. All items will be signed. Everyone should just have fun with this. At this point, who knows who will win? Will it be the most creatively daring entry? A traditional approach? I'm open to anything as long as it's great! Only 3 will eventually win the prizes, but everyone who enters will have their artwork posted on this blog for all to see. Please post any question here on the blog in case others have the same question. Email me if you want a higher resolution version of the artwork. And below is pic to show you what these characters look like in color. Thanks everyone, I hope we all have a great time with this! Free art on Facebook, from cartoonist Jim Mohan! The other day on Facebook (yeah, I got a page! ), I saw the Profile for JIM MOHAN, a Minneapolis-based cartoonist. 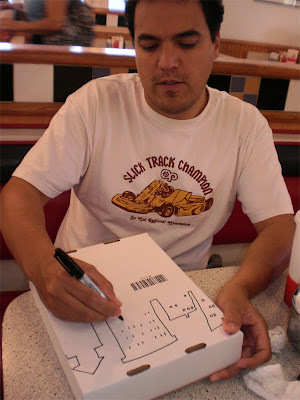 He's currently the artist of "The Rat Race" in the local APWU (American Postal Worker's Union) newsletter! That's just cool that a Union's member's newspaper is running a comic strip. Anyways, this is a nice little thing Jim's doing. In this day and age of billion dollar comic book mergers, and ding-a-ling company wide continuity crossovers, it's refreshing to find artists doing things for fun (and for free!). Thanks to Jim for doing this! 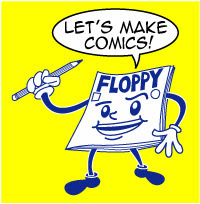 Free DIY comics seminar, Xomix Comix for sale and more this Saturday! 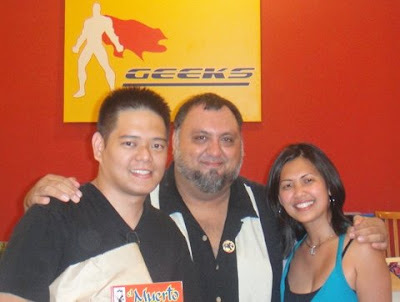 GEEKS Comics in Whittier is going to be ground zero for all kinds of coolness this weekend! 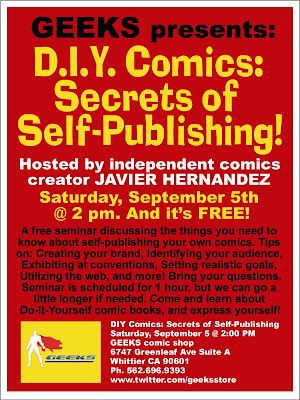 I'll be conducting a free seminar on self-publishing comics on Saturday at 2pm! 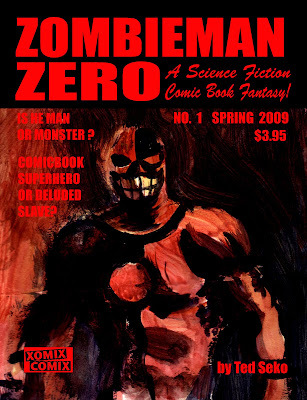 Also just added to my appearance at GEEKS, I'll have freshly printed copies of both MAN-SWAMP and ZOMBIE MAN ZERO for sale! 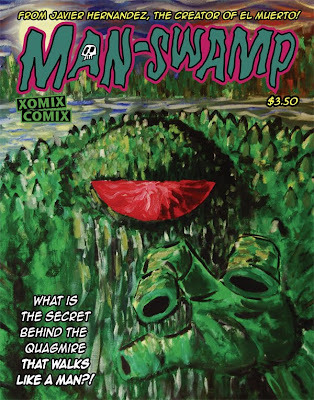 Ted Seko, creator of ZOMBIE MAN ZERO, and myself, the creator of MAN-SWAMP, have created a new imprint, and these two books are the first titles to be released. Buy your copies at GEEKS before they're made available to the whole world via the upcoming, online Xomix Comix shop! 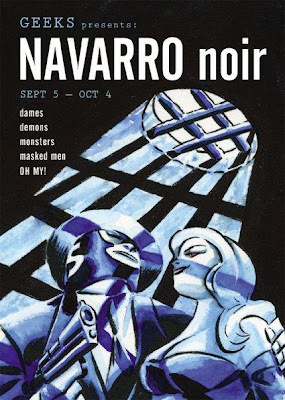 And if that's not enough excitement for one day, Saturday is also the day of the Opening Reception for cartoonist Rafael Navarro's one-man exhibit, NAVARRO NOIR! The reception starts at 7pm. Rafael will of course be there, and you'll even find me hanging around that evening, along with a few other L.A. area cartoonist types.